CAMBRIDGE, ENGLAND — British archaeologists working on the Must Farm project in England’s Cambridgeshire Fens can hardly restrain themselves. The dig offers, as site manager Mark Knight from the Cambridge Archaeological Unit put it, “a genuine snapshot” of a lost world — a prehistoric settlement from the Bronze Age some 3,000 years ago. The dig is almost without precedent the most revelatory of its kind in Britain, if not in Europe, and it has already begun to transform our knowledge of life in the Bronze Age. The site has been described as the British Pompeii. Both places are relics of single dramatic events. The Bronze Age settlement at Must Farm was destroyed suddenly and violently by fire a thousand years earlier. The round houses — of wattle, reed, and timber — and their contents collapsed into the water and more importantly, into the river silt. It’s the speed of the event — the brevity of it, the almost instant entombment of the material — that makes the find so exciting. Much of what was tipped into the water is in pristine condition. They’ve found pretty much everything they could have ever hoped for. The truth is we didn’t know that much about ordinary Bronze Age man. We will learn more about what they wore — some of the textile fragments (about 80 pieces, including linen) are very finely weaved and a cluster of footprints was discovered in the silt from which shoe sizes can be determined. Unlike Pompeii, there are no skeletons. There is an unprecedented abundance of burnt timber to analyze (some 4,000 pieces). It’s probable that we will find out what caused the fire — initial forensic research suggests it may have been started deliberately. 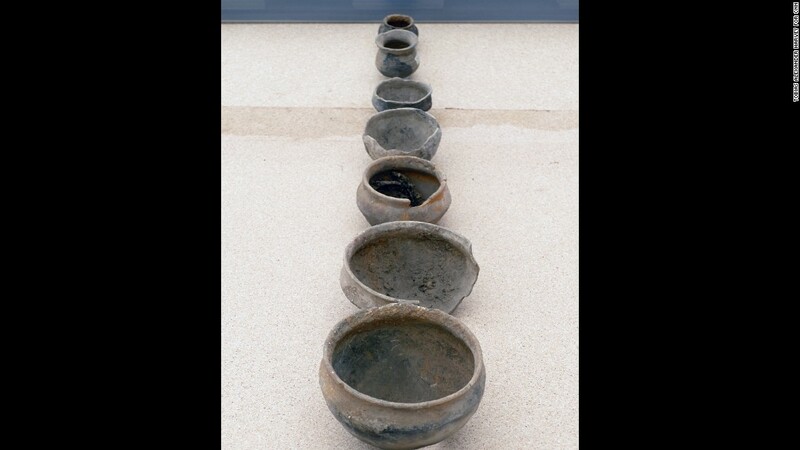 Of the five round houses excavated, each had a set of about a dozen pots — simple, plain and beautifully hand-made. Bronze Age man farmed the land, managed the woodland. They were skilled carpenters — they ate off wooden plates; they carved wooden boxes. A prized discovery was the almost perfectly preserved wheel of a wooden cart. And they left us their most treasured bronze possessions –15 ax heads, five sickle heads and five spear heads. 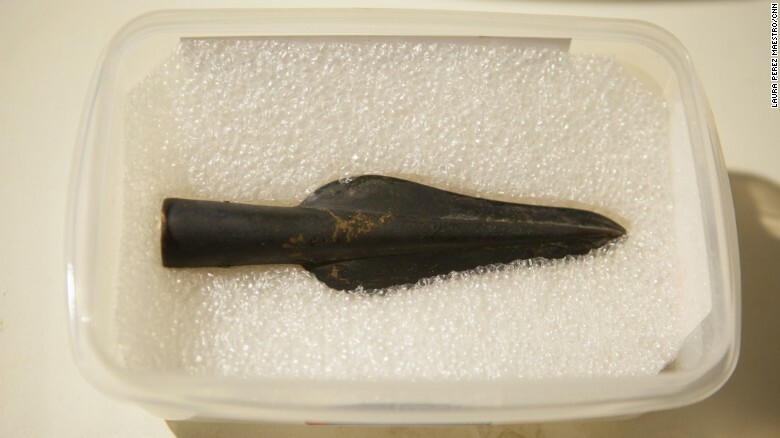 In one of the rarest finds, a spear head was found with its haft or handle still in tact. 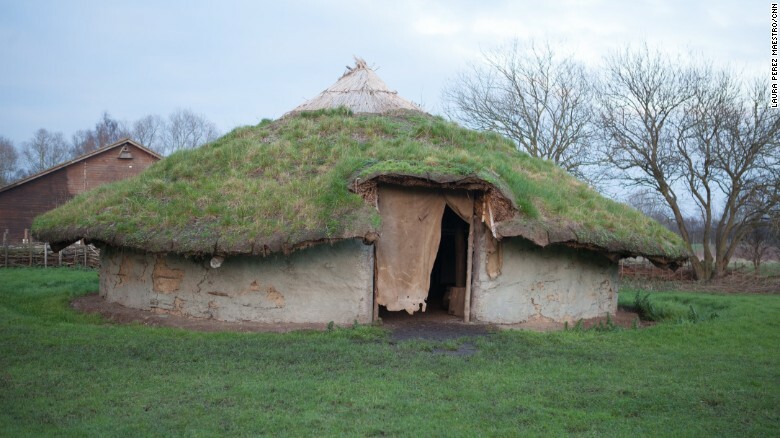 Archaeologists now also know precisely how the round houses were built. They have the architecture — the wattle, the uprights, the posts. You can see the ax marks. With the right will and adequate funding, they could accurately make a replica of the settlement as an open-air museum in the Fens. The archaeological site has extraordinary clarity, cogency and intimacy. You can easily imagine what it was like for our ancestors 3,000 years ago. Running across one part of the site is a narrow wooden causeway, a series of oak planks less than a meter across. Pre-dating the settlement, it rests there invitingly — cleaned of mud and silt — waiting for us to follow in our ancestors’ footsteps.